A: COD orders that are place before 2 pm EST will ship on the same day. COD orders that are placed after 2 pm EST will ship on the next business day. Pay by Mail orders are shipped out on the day your payment is received and processed at the company mailing address. All orders are shipped via 2-day or overnight service. Saturday delivery is available on request for an additional fee (not available in all areas). Q: Do you deliver to addresses outside of the United States? A: No, we are currently unable to ship orders to addresses outside the U.S.
A: Unfortunately, FedEx will not deliver to PO Boxes. Q: Do I have to be at home to receive the package? A: For COD orders, someone must be home to give the check to the driver. The driver will not leave the package until payment is made. Q: Can you deliver to my office? A: Yes. Just provide your work address in the delivery information. Q: Can I open the package and inspect its contents before I give the check to the driver? A: FedEx’s policy is to present the package upon receiving a signature (and in the case of COD, a payment as well). We do not suggest opening the package in front of the driver. A: If you provided an e-mail address when you placed your order, you will receive an e-mail at approximately 7pm (EST) on the day of shipment that will contain the tracking information from FedEx. If you did not leave an e-mail address you can call our toll-free customer service line after 7pm on the night that your order shipped and we will give you your tracking information. If you had created an account when you logged in you may check the FedEx tracking number by logging into your account after 7pm on the day that your order ships. Q: I forgot my password. How do I get a new one? A: You will need the email address used the last time you ordered. A temporary password can be emailed to you by submitting that email address here. Q: What are the risks that I assume in purchasing exotic currency? Q: How do I know the notes are authentic? 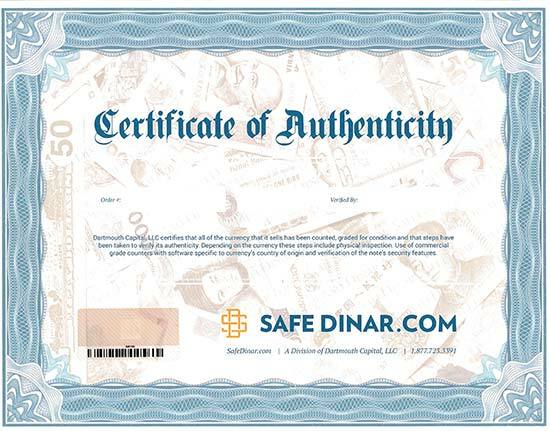 A: Every order includes a Certificate of Authenticity. We have taken steps to verify the authenticity of the currency. View security features here. Q: What does it mean when I see people say the Iraqi Dinar will “reval”? A: It is common on many forums to see people looking for information like “when will the Dinar reval." You are likely seeing a person referring to the possibility that there will be a change to the current exchange rate of the Dinar. This is a common question that we hear from customers and others interested in exchanging US Dollars for the Dinar, but it is not possible for us to know or truly predict a change in the exchange rate. We simply offer a service that allows you buy and sell Iraqi Dinar in exchange for the US Dollar. We would encourage you to seek help from a financial adviser if you are looking for investment advice. Q: How do I apply your 12k Free Dinar promotion to my next order? A: After you've placed an order with us, you'll receive an email with a link that activates our Free 12k Dinar promotion. After clicking the link and when placing your new order, you'll see the promotion activated in your cart. Note that your new order total must exceed 1M IQD or $950 USD to quality for the promotion.